love your necklace dear! everything is so nice in this look! You look gorgeous!Love the coat! AND this upper classy clutch (subtly) achieves to infuse an electrifying twist on your uber sweet § soft, wrongly icy outfit Here I must say Dear (“Kind aesthete’s uber approving look”) ! Gorgeous outfit! Love your clutch and necklace! soo cool and stylish! love the mix of colors!! So simple yet sophisticated and beautiful! 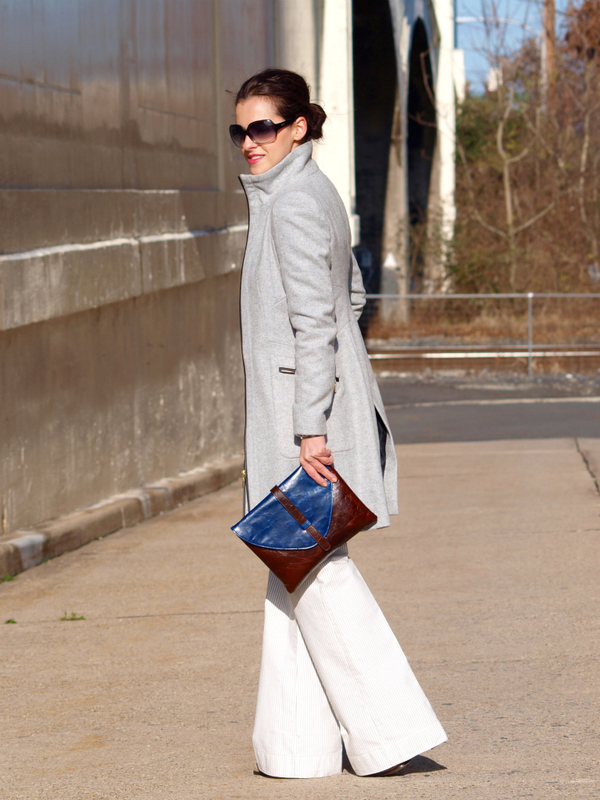 Wow you look so chic,babe!The pants are amazing,I love that they are a little bit too long!Great clutch! Vaya clutch más bonito! El look en sí es una pasada…el abrigo me encanta!! Muy guapa! I love it your look! Beautiful! love your coat! you look amazing, I have the same pants but you wear them so much better!!! Love the mix brown-blue. besos desde Buenos Aires. Every time you look better and better! I love here everything! indeed. You look sooooooooo fresh!Sooooooooooo elegance!Photos the best! You look so classy! Love the colours of the clutch! such a great outfit love the necklace! thank you very much ladies!!!! Gorgeous outfit! Love the jacket and the pants! Alena: Oh, It’s Just Perfect! Beautiful! I love the touches of blue in the necklace and clutch! stunning stunning stunning! I am in love with this outfit. Everything I am obsessed with.. from the pants to the jewelry to the clutch. So great ang perfectly chic girl!! Thanks for your comment! You look so classy and beautiful! Stunning chic look girl, love the muted tones on you, the wide leg trews and clutch! You look amazing! I love the structure of that jacket and that clutch! lovely outfit, you look stunning gorgeous !! Love you shades !! you look beautiful, this look is made for you! You look so chic in this outfit. Very elegant. The accessories are perfect too. wow amazing! I love the coat & bag on you! Love the wide leg pants! love the clutch and studded bracelet! 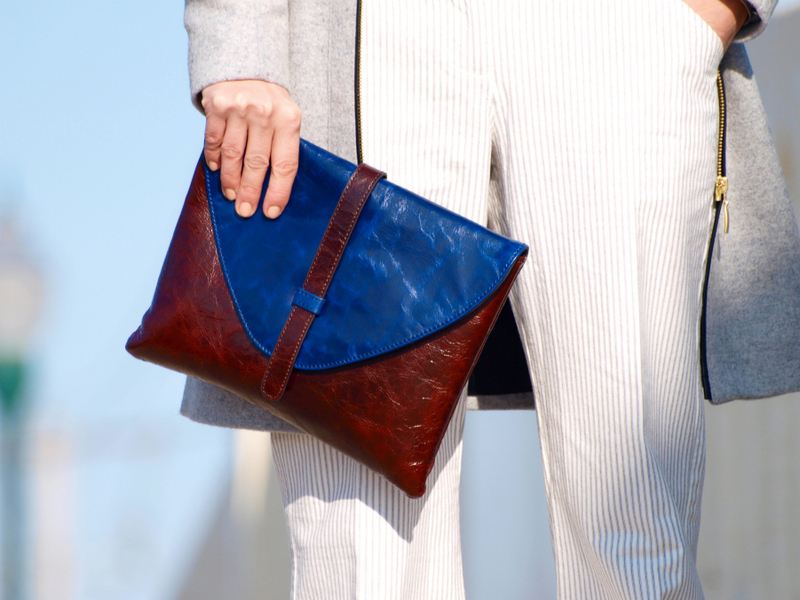 Such a stunning clutch — beautiful colors! That jacket has the perfect modern edge and pairs perfectly with the clutch and bracelet! Just lovely Veronica! I am SO ready for the holidays and can’t wait to see family! Wow!! I love this coat!! !It’s so beautiful!! I really wanted to buy that coat (it’s beautiful :)) but in Poland is too cold for it ;) Anyway – you look amazing! You look gorgeous! Like a modern day Audrey Hepburn! You look gorgeous as ever! obsessed with those slacks and your clutch, beautiful! Thank you for stopping by over at my blog! This is a great business look and it suits you well. Lucky you, the sun is so nice on the pictures..I mean the sunlight! :) Love this combo, so clasy and elegant! Clutch is perfect! Such a polished look! I don´t know anyone who can rock an entire light grey outfit like you! thank you very much for your comment, I too have really enjoyed your photos and your style. You look so classic and chic! I really love the pop of color with both the clutch and necklace. Always gorgeous! great outfit!! you are so stylish! That clutch is ah-mazing! I want it too! You look great! And classy! You look so beautiful….great shots!!! nice outfit – I love the coat, Ive seen a few bloggers wear it, but I love how you styled it the most. And ofcourse the clutch, is stunning, very pretty. Oh you look so chic, I really love the pop of blue of your necklace! This is so unbelievably chic. The jacket is amazing and I love the necklace and cuff. Really great look! I love the brighter blue on top of the grey outfit, really makes it pop! omg! the coat is amazing! love the whole look! Oh my, I loooove everything on you! Well put together and it looks very stylish and cool! WOW WOW WOW Ure STYLE IS INCREDIBLE. Look almost like ure going for FASHION WEEK. TOTALLY FABULOUS. That bracelet looks just like HERMES one. COOL.